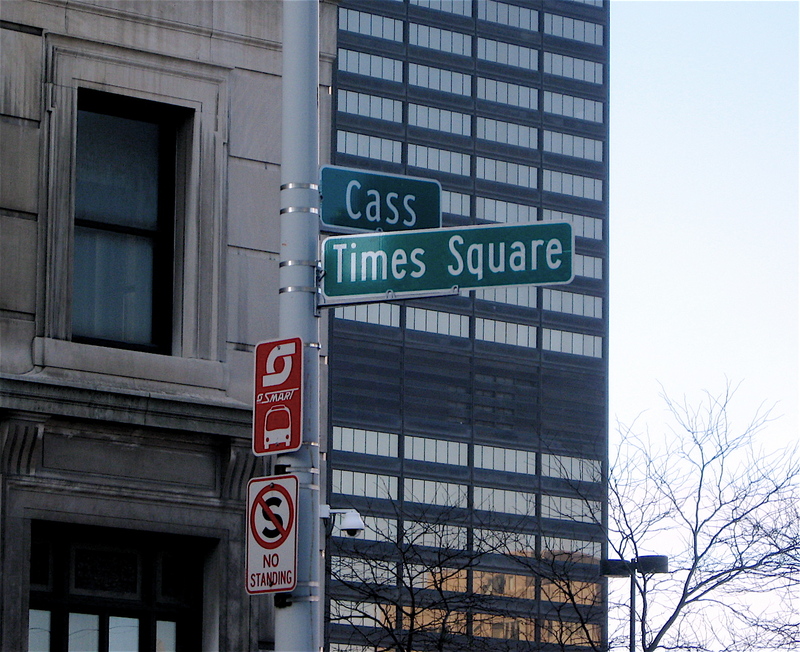 Not that one, Detroit’s Time Square! May you have a bright and cheerful Christmas! Detroit has a tremendous amount of early to mid- 20th Century homes. Traditional brick English Tudors, bungalows and Colonials are spread across the neighborhoods from the east to the west side. There’s also a large concentration of working class frame houses lining many of the older, densely packed neighborhoods and streets. Victorian era homes can be found in several historic districts and other sections of the city close to the Detroit River. Even suburban style brick ranches can be found in Detroit. They seem to be clustered in neighborhoods that were developed in the 1950s. Those sections of the city generally bump up to the suburban communities ringing the city limits. Most of the neighborhood dwellings have freestanding, one or two car wood frame garages that were constructed as the homes were being built. One of the remarkable sights I often see while riding my bike in some of the neighborhoods are the 60 plus year-old garages with significant leans. Some have a slight tilt of a couple of inches. Others seem to be leaning a good 25 degrees or more, much beyond the famous Leaning Tower of Pisa’s meager five degrees. A few have completely collapsed from rot, deterioration and lack of homeowner maintenance. My favorites by far, are the major leaners. Those that look as if a small breath of air could bring them down in a cloud of dust. 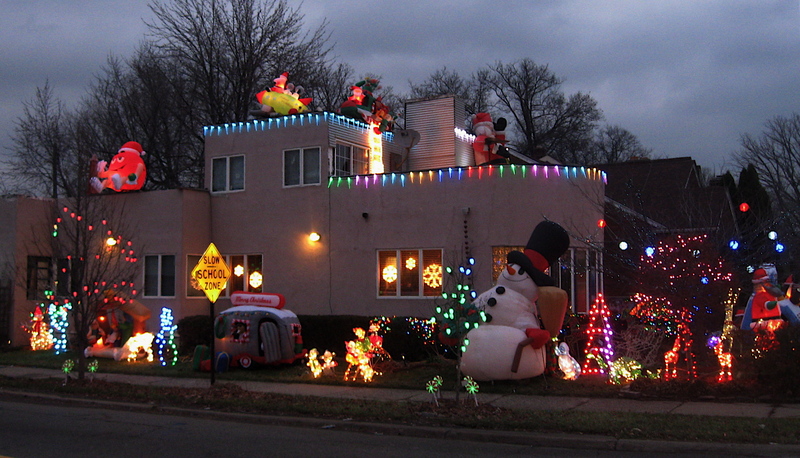 A few of the Detroit leaners I’ve spotted appeared to be teetering close to an inevitable collapse. One in particular I saw was standing by itself on a lonely patch of urban prairie land that was once, I assume, a solid working class neighborhood full of single-family homes. Looking at that forlorn structure with a hefty lean, I decided to see if I could push it over. So I jumped off my bike, headed over and gave it a big shove. Wow, was I surprised. 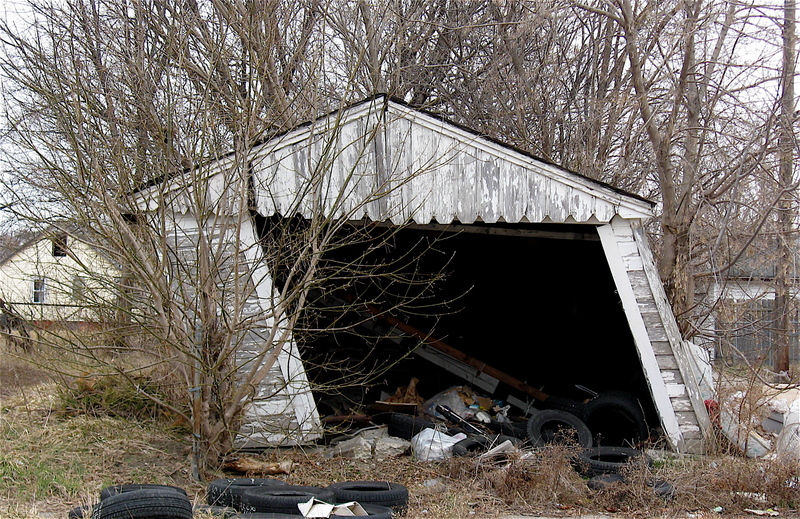 That old wooden garage wouldn’t give an inch. While pushing on it, I felt as if I were trying to move a wheelbarrow full of cinder blocks up an embankment, almost an impossible task. Despite its wobbly appearance, sagging roof and steep angled lean, it was still a solid, well-built structure standing tall. It will be interesting to see if that longstanding, paint chipped, sad-looking wooden building will be strong enough to survive winter. 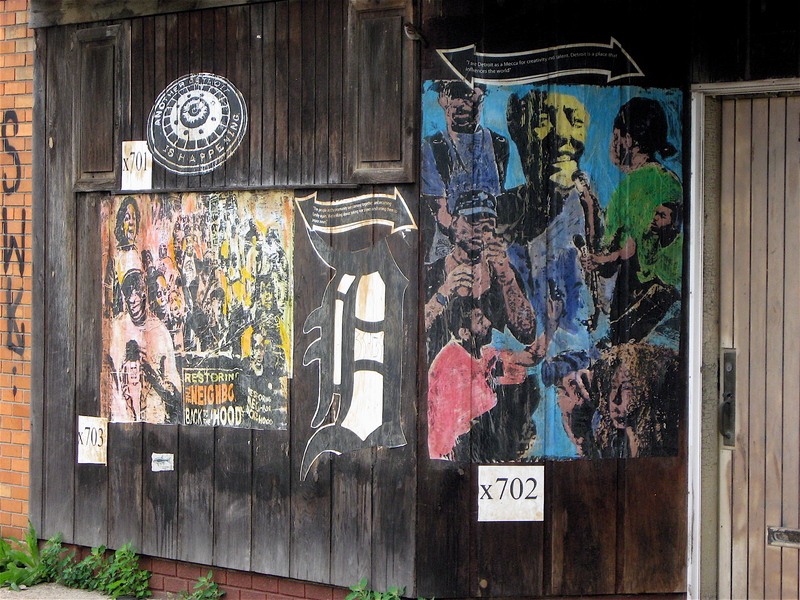 Riding throughout the city of Detroit I see many peculiar signs posted or painted on the sides of buildings. Some are quite creative in their advertising message. Others are crude in their execution, layout and design. I’ve seen all types of graffiti; well designed colorful paintings and simple one line, one color tags promoting some sort of goods or services. Some are real attention grabbers like the series of unusual murals found on buildings along Harper Avenue on Detroit’s eastside. 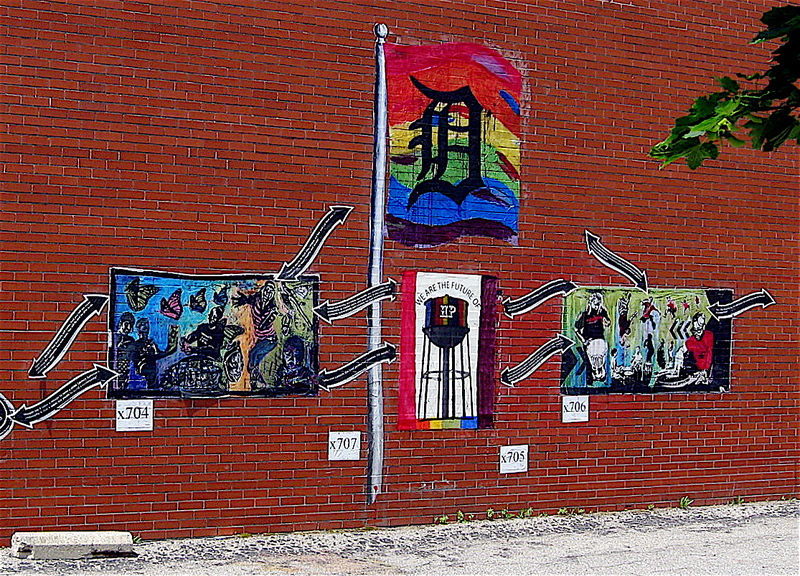 I’ve also spotted the same type of murals in an industrial area near the Davidson Expressway in Highland Park, that small city within the city of Detroit. 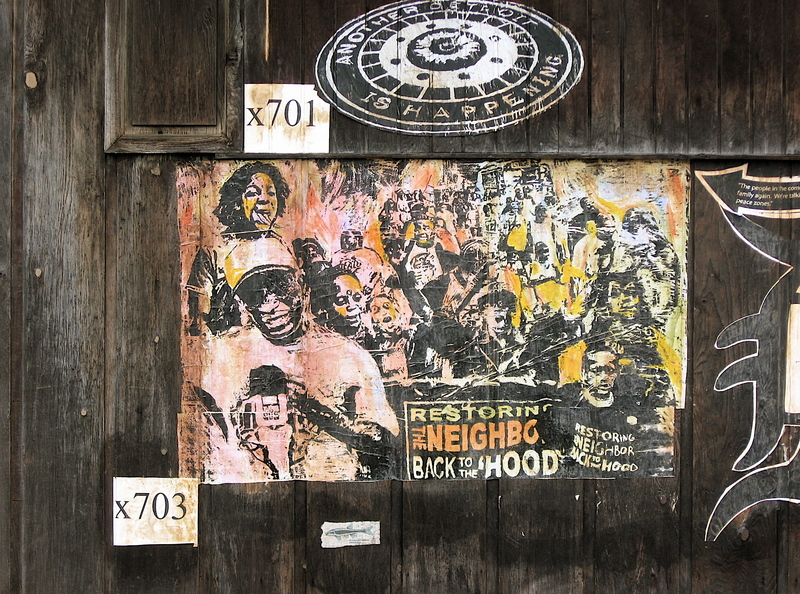 The first wall paintings I saw in this series were on an abandoned building along Harper Avenue Curiously, they all had a unique identification number prominently displayed next to each image. The numbers sparked my interest, making me wonder what they were all about. 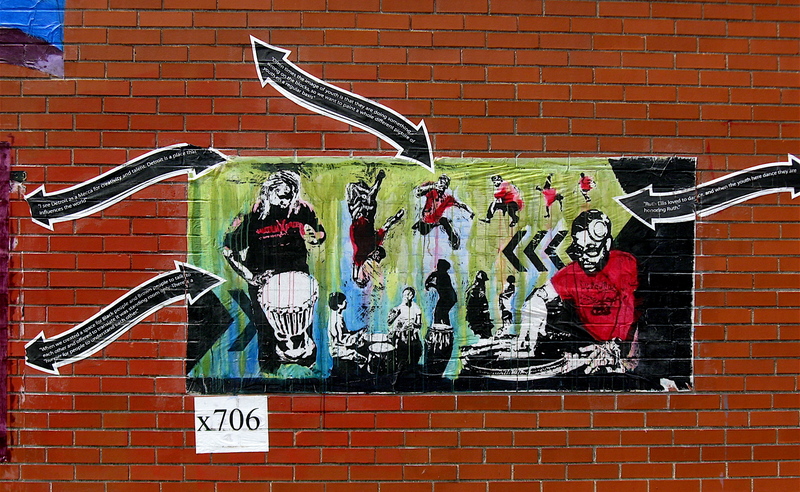 It wasn’t until a couple of months later, when I came across the murals in Highland Park, that the numbers started to make sense. 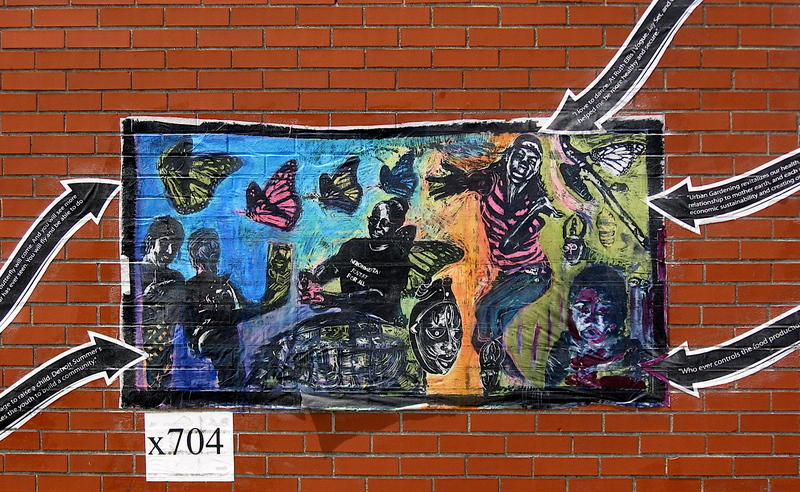 There, posted on a wall next to the pieces, was a website address and a short message inviting people to visit the site for info on the murals. I did just that, and strangely, there was nothing there related to the murals. I recently revisited the site, called Detroit Summer. Much to my surprise it had been revamped and now has a short video on the murals I stumbled upon. 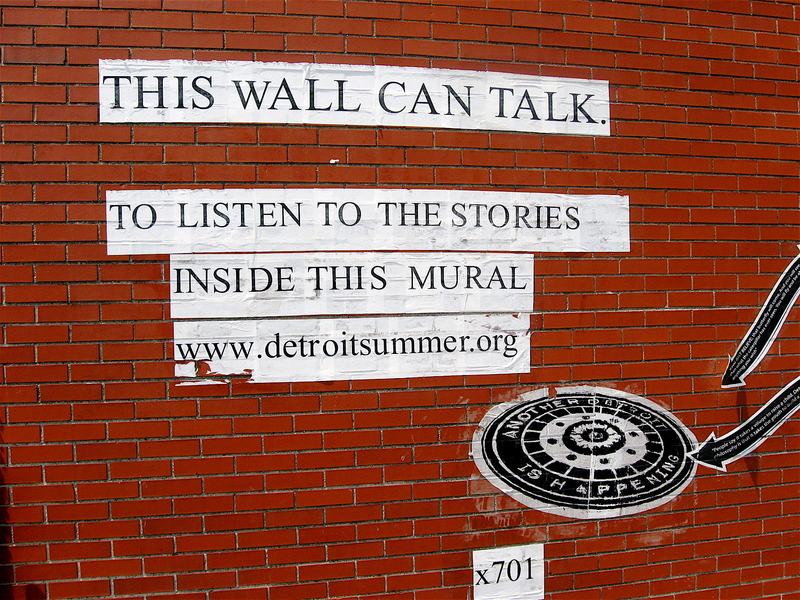 Detroit Summer appears to be the organization that commissioned and placed the murals on those walls. It is basically a youth led alliance that uses music, poetry and art to examine problems of the community and offer positive solutions. Click here to visit the site and read up on this youth based grass-roots organization.